We’d love your help. 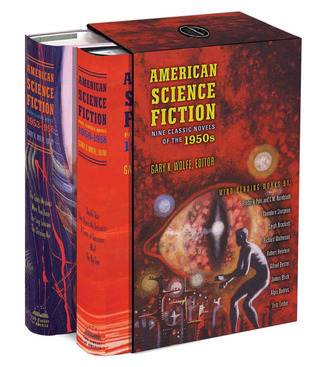 Let us know what’s wrong with this preview of American Science Fiction by Gary K. Wolfe. To ask other readers questions about American Science Fiction, please sign up. A story about the aftermath of nuclear war where small communities are self-supporting and cities are outlawed. The characters were mostly likable and believable, and I enjoyed a lot of their interactions. It was a decent story, except the ending didn't fit and washed out a lot of the meaning. A cold-war era story that includes cybernetics: what happens if an Allied scientist is "rescued" by Soviets after a laboratory explosion and returned with a metal head, chest, and arm? How do you tell if it's really the original scientist, and if so whether or not he's been turned or booby trapped? The premise was quite interesting but the story eventually ran out of steam, until the author threw a bit of a monkey wrench in the works that didn't pan out anyway. This was by far the worst book of the set, and since it is the last one and the shortest one I'm tempted to think it was included only because it fit the page count. The premise is neat: two sides fighting a war when both sides can time travel, so our timeline is a constantly shifting set for agents from both sides to fight or undermine each other. Unfortunately, we get to see almost none of this happen. The setting is a pocket outside the normal time-space continuum where agents from one side go to heal and rest after missions. I never really understood who each of the characters were because the history is kind of alternate and the writing is incomprehensible and very little is explained. The only reason this got more than one star is because there was an actual plot that could be followed if you put in the effort to plow through the writing. 3.5 stars: The Stars My Destination, The Long Tomorrow, Who? Overall rating: exactly 3.5 stars (interesting because I wrote down all those ratings before seeing the average). Because most of the stories were good I'll round it up to four. The Space Merchants, by Frederik Polh ad C. M. Kornbluth: A dystopian satire of consumerism run amok, in which advertising is not only a profession but the de facto government. More Than Human, by Theodore Sturgeon: Imagines the evolution of a new species of humanity, Homo Gestalt, and how it gains the key to survival, a conscious. The Long Tomorrow, by Leigh Backett: Among the first meditations on the aftermath of nuclear holocaust, in which humans resort to primitive living, except for a handful of scientists in a mythical city. The Shrinking Man, by Richard Matheson: The novel that birthed the movie cult classic, in which a man shrinks down to walk among the most basic elements. Double Star, by Robert A. Heinlein: Follows the exploits of a near do well thespian as he assumes the role of a lifetime that lasts a lifetime. The Stars My Destination, by Alfred Bester: About a man driven to the ends of the solar system, and ultimately beyond, by his thirst for revenge, loosely patterned after Dumas’ The Count of Monte Christo. A Case of Conscious, by James Blish: In the future, a commission of humans confront the issue of morality without god on the planet Lithia, and the effect it would have on Earth society. Who?, by Algis Budry: A mash up of Cold War espionage, sci-fi, and alternative history that has a man questioning his very identity. The Big Time, by Fritz Leiber: As much a philosophical query into the nature of life, the effects of perpetual war, external life, love, and cynicism about pretty much everything, as it is about time travel and the disruption of the time line. Wonderful Classic Science Fiction. Recommend to any scifi fan. Gary K. Wolfe is a science fiction editor, critic and biographer. He is Professor of Humanities in Roosevelt University's Evelyn T. Stone College of Professional Studies.